Yvonne Catterfeld (born 2 December 1979) is a German singer, songwriter, actress and TV host. Born and raised in Erfurt, Thuringia, she later moved to Leipzig to pursue her music career on the University of Music and Theatre. In 2000, she participated in the debut season of the singing competition series Stimme 2000, where she came in second place. Catterfeld subsequently signed a recording deal with Hansa Records, which released her debut single "Bum" in 2001. The same year, she was propelled to stardom when she was cast in a main role in the German soap opera Gute Zeiten, schlechte Zeiten . In 2003, Catterfeld made her musical breakthrough when her fifth single, "Für dich", became an international number-one hit and produced the equally successful album Meine Welt . Erfurt is the capital and largest city in the state of Thuringia, central Germany. Thuringia, officially the Free State of Thuringia, is a state of Germany. Leipzig is the most populous city in the federal state of Saxony, Germany. With a population of 581,980 inhabitants as of 2017 it is Germany's tenth most populous city. Leipzig is located about 160 kilometres (99 mi) southwest of Berlin at the confluence of the White Elster, Pleiße and Parthe rivers at the southern end of the North German Plain. Catterfeld continued booking success with follow-up albums Farben meiner Welt (2004) and Unterwegs (2005), which spawned the hit singles "Du hast mein Herz gebrochen" and "Glaub an mich". Following her departure from GZSZ and a starring role in the short-living telenovela Sophie – Braut wider Willen , she released her fourth album Aura , which was less successful commercially and led to a decline in her musical career. She transitioned to Sony Music, and after an unsuccessful period, returned to the top of music charts with the reissue of her sixth album Lieber so (2013), when she appeared in the second season of Sing meinen Song - Das Tauschkonzert , the German version of the series The Best Singers . Farben meiner Welt is the second studio album by German recording artist Yvonne Catterfeld, released by Hansa Records and BMG on March 1, 2004. Unterwegs is the third studio album by German recording artist Yvonne Catterfeld, released by Sony Music on March 14, 2005 in German-speaking Europe. A telenovela is a type of limited-run television serial drama or soap opera produced primarily in Latin America. The word combines tele, short for televisión or televisão, and novela, a Spanish and Portuguese word for "novel". Similar genres around the world include teleserye (Philippines), téléroman, or simply dramas. In Spain, they are also called culebrones because of the convoluted plots. Throughout a career spanning 15 years, Catterfeld has sold over 800,000 records as a solo artist, making her one of the best-selling German music artists in the early 2000s. Aside from her commercial accomplishments, her work has earned her numerous awards and accolades, including a Bambi Award, a Goldene Stimmgabel, and an ECHO Award. An established actress, she has appeared in several international television and theatrical films, including Keinohrhasen (2007), The Promise (2011), and Beauty and the Beast (2014). In 2016, she became a coach on the German television series The Voice of Germany . The Bambi, often simply called the Bambi Award and stylised as BAMBI, are presented annually by Hubert Burda Media to recognize excellence in international media and television, awarded to personalities in the media, arts, culture, sports and other fields "with vision and creativity who affected and inspired the German public that year," both domestic and foreign. First held in 1948, they are the oldest media awards in Germany. The award is named after Felix Salten's book Bambi, A Life in the Woods and its statuettes are in the shape of the novel's titular fawn character. They were originally made of porcelain, until 1958 when the organizers switched to using gold, with the casting done by the art casting workshop of Ernst Strassacker in Süßen. The Goldene Stimmgabel is an annual prize awarded within the German music scene. A television film is a feature-length motion picture that is produced and originally distributed by or to, a television network, in contrast to theatrical films, which are made explicitly for initial showing in movie theaters. East Germany, officially the German Democratic Republic, was a country that existed from 1949 to 1990, when the eastern portion of Germany was part of the Eastern Bloc during the Cold War. It described itself as a socialist "workers' and peasants' state", and the territory was administered and occupied by Soviet forces at the end of World War II — the Soviet Occupation Zone of the Potsdam Agreement, bounded on the east by the Oder–Neisse line. The Soviet zone surrounded West Berlin but did not include it; as a result, West Berlin remained outside the jurisdiction of the GDR. An athlete is a person who competes in one or more sports that involve physical strength, speed or endurance. The application of the term to those who participate in other activities, such as horse riding or driving, is somewhat controversial. Mitteldeutscher Rundfunk is the public broadcaster for the federal states of Thuringia, Saxony and Saxony-Anhalt. Established in January 1991, its headquarters are in Leipzig, with regional studios in Dresden, Erfurt and Magdeburg. MDR is a member of the ARD consortium of public broadcasters in Germany. Bertelsmann Music Group was a division of German media company Bertelsmann before its completion of sale of the majority of its assets to Japan's Sony Corporation of America on 1 October 2008. Although it was established in 1987, the music company was formed as RCA/Ariola International in 1984 as a joint venture to combine the music label activities of RCA Corporation's RCA Records division and Bertelsmann's Ariola Records and its associated labels which include Arista Records. It consisted of the BMG Music Publishing company, the world's third largest music publisher and the world's largest independent music publisher, and the 50% share of the joint venture with Sony Music Entertainment, which established the German American Sony BMG Music Entertainment from 2004 to 2008. Hansa Records was a record label founded in the 1960s based in West Berlin, West Germany. All Saints are a British-Canadian pop girl group formed in 1993. They were founded as All Saints 1.9.7.5 by members Melanie Blatt, Shaznay Lewis and Simone Rainford. The group struggled to find commercial success upon being signed to ZTT Records and were dropped by the label shortly after Rainford left the group. In 1996, the group were joined by sisters Nicole and Natalie Appleton and signed to London Records under their shortened name. "Never Ever" is a song by British-Canadian girl group All Saints. Written by All Saints member Shaznay Lewis along with co-writers Robert Jazayeri and Sean Mather, using the tune from the famous British folk song “Amazing Grace”, and produced by Cameron McVey and Magnus Fiennes, it was released on 10 November 1997 as the second single from their debut album, All Saints (1997). The song later appeared on their compilations All Hits (2001), Pure Shores: The Very Best of All Saints (2010) and their remix compilation The Remix Album (1998). Lyrically, the song talks about the girls feeling their first expressions after a sudden break-up, where the girls query what they did wrong in the relationship. Catterfeld in Vienna in September 2010. Catterfeld with partner Oliver Wnuk at the Deutscher Fernsehpreis 2012. 2005 Hallo Robbie! Kerstin Steinhage Episode: "Schicksalhafte Begegnung"
2008 SOKO 5113 Tiffany Tanner Episode: "Seifenoper"
Jeanette Biedermann, also known by her stage name Jeanette, is a German recording artist, actress, and television personality. Born and raised in Berlin, Biedermann began performing as a member of a troupe of acrobats in a children's circus at the age of six. She later attended beauty school before dropping out to pursue her music career following her participation and win of the Bild-Schlagerwettbewerb competition in 1999. Christina Klein, better known by her stage name LaFee, is a German singer/songwriter who has sold more than one million records worldwide. She is most famous in mainland Europe, particularly in German-speaking countries. 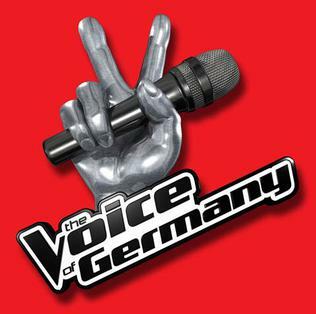 The Voice of Germany is a German reality talent show created by John de Mol and based on the concept The Voice of Holland. It is part of an international series. It began airing on ProSieben and Sat.1 on 24 November 2011. "Für Dich" is a song by German recording artist Yvonne Catterfeld. It was produced by Dieter Bohlen and written by Bohlen, Klaus Hirschburger und Lukas Hilbert. Recorded for Catterfeld's debut studio album, Meine Welt (2003), the ballad was released on May 5, 2003 as its fourth single. The German singer Yvonne Catterfeld has released seven studio albums, two compilation albums, two video albums and seventeen singles. After finishing second in the inaugural season of the television competition Stimme 2000, she was signed to a recording deal with Hansa Records. In 2001, she released her first single, "Bum", under her stage name Catterfeld; the song failed to chart in any music market. Her first album, Meine Welt (2003), was preceded by four further singles, including "Niemand sonst" and "Gefühle", both of which reached the top forty of the German Albums Chart, and "Für Dich" which reached number one in Austria, Germany and Switzerland and marked her commercial breakthrough. Meine Welt went Platinum in Germany and earned a Gold certification in Austria and Switzerland. Meine Welt is the debut studio album by German recording artist Yvonne Catterfeld, released by Hansa Records and BMG on May 26, 2003. Lieber so is the sixth studio album by German recording artist Yvonne Catterfeld, released by Columbia Records and Sony Music on 22 November 2013 in German-speaking Europe. While production of the album was overseen by Roland Spremberg, several musicians contributed to Lieber so, including producers Marcus Brosch and Christian "Crada" Kalla as well as rappers Kitty Kat and Sera Finale, Jennifer Rostock keyboarder Joe Walter, and Swiss pop singer Mia Aegerter. Aura is the fourth studio album by German recording artist Yvonne Catterfeld, released by Sony Music on October 20, 2006 in German-speaking Europe. Blau im Blau is the fifth studio album by German recording artist Yvonne Catterfeld, released by Sony Music on March 5, 2010 in German-speaking Europe. "Niemand sonst" is a song by German recording artist Yvonne Catterfeld, recorded for her debut studio album Meine Welt (2003). It was written by Götz von Sydow and Ralf Hildenbeutel and produced by the latter along with Matthias Hoffmann and Steffen Britzke under their production moniker Schallbau. A mid-tempo pop soul track with slight elements of the contemporary R&B genre, it was the second single to precede Meine Welt and reached number 31 on the German Singles Chart. "Lieber so" is a song by German recording artist Yvonne Catterfeld, recorded for her same-titled sixth studio album (2013). It was written by Marcus Brosch and Katharina "Kitty Kat" Löwel and produced by Roland Spremberg. A melancholic folk pop ballad, the song's lyrics revolve around the breakdown of a relationship with the female protagonist expressing her love for a man whom she attempts to leave. The instrumentation of "Lieber so" includes an acoustic guitar, a cello and a glockenspiel. "Pendel" is a song by German recording artist Yvonne Catterfeld. It was written by Thomas Dörschel, Johannes Walter-Müller, and Alexander Freund and produced by Roland Spremberg for her sixth studio album Lieber so (2013). Built on a hand-clapped rhythm and pulsating beats, the uptempo song's instrumentation consists of soft percussion instruments and a piano. In "Pendel", Catterfeld talk about the changes that come from and may result in fortune, crises, and progress. "Hey" is a song by German recording artist Andreas Bourani. It was written by Bourani along with Julius Hartog, Jasmin Shakeri, and Philipp Steinke for his second album Hey (2014), while production was helmed by the latter. The ballad was released as the album's fourth and final single. It reached the top thirty in Germany and the top forty on the Swiss Singles Chart upon its December 2015 release. A live cover version of "Hey", recorded by pop singer Yvonne Catterfeld during her performance on the second season of reality television series Sing meinen Song – Das Tauschkonzert, the German version of The Best Singers series, had previously reached the top twenty on the German Singles Chart. Guten Morgen Freiheit is the seventh studio album by German recording artist Yvonne Catterfeld. Released on 10 March 2017, it marked Catterfeld's debut release with her independent record company Veritable Records following her departure from Columbia Records. Her highest-charting album since Unterwegs (2005), it debuted at number four on the Austrian and German Albums Chart, respectively, and peaked at number seven in Switzerland. "Irgendwas" is a song by German recording artist Yvonne Catterfeld, recorded along with Bengio for her seventh studio album Guten Morgen Freiheit (2017). Selected as the album's first single, it was released as a digital download on 9 December 2016. It debuted and peaked at number 27 on the German Singles Chart, becoming her highest-charting lead single since 2006's "Erinner mich, dich zu vergessen". "Gefühle" is a song by German recording artist Yvonne Catterfeld, recorded for her debut studio album Meine Welt (2003). It was written by Klaus Hirschburger, Mirko von Schlieffen, Achim Jannsen, and Manfred Thiers, while production was helmed by von Schlieffen, Jannsen, and Thiers. A mid-tempo ballad, the song was selected as the third single to be lifted from Meine Welt (2003). "Du hast mein Herz gebrochen" is a song by German recording artist Yvonne Catterfeld. It was written by Dieter Bohlen, and Eko Fresh and produced by the former for her second studio album Farben meiner Welt (2004). "Du bleibst immer noch du" is a song by German recording artist Yvonne Catterfeld. The ballad was written by Catterfeld, A.C. Ademy, and Christoph Leis-Bendorff for her second studio album Farben meiner Welt (2004), while production was helmed by the latter. ↑ "Yvonne Catterfeld "Lieber so (Bonustrack-Edition)", 2015". Universal Music . Retrieved May 23, 2015. 1 2 3 Dreyer, Patricia (2006-04-05). "Meine schwere Kindheit in der DDR". Bild.de . Retrieved 2015-10-25. 1 2 "Sagen Sie jetzt nichts, Yvonne Catterfeld". Süddeutsche Zeitung . Retrieved 2015-10-25. 1 2 3 "Biografie — Yvonne Catterfeld". laut.de. Retrieved 2015-10-25. ↑ "Various – Stimme 2000 – Die Finalisten". Discogs . Retrieved 2015-10-25. ↑ "Catterfeld – Bum". Discogs . Retrieved 2015-10-25. 1 2 "Yvonne Catterfeld: Auf Umwegen zum Erfolg". Eurovision.de. Retrieved 2015-10-25. ↑ "Catterfeld – Komm zurück zu mir". Discogs . Retrieved 2015-10-25. 1 2 3 4 5 6 "Chartverfolgung / Yvonne Catterfeld / Single" (in German). musicline.de PhonoNet. Retrieved 2010-03-27. 1 2 "Udo Lindenberg – Atlantic Affairs". Discogs . Retrieved 2015-10-25. 1 2 "Von der Soap in die Charts!". RP-Online.de. 2005-02-11. Retrieved 2015-10-25. ↑ "Soap-Star holt Pole Position bei den deutschen Singles". MusikWoche. Mediabiz. 2003-05-14. Retrieved 2015-10-25. ↑ "Porträt einer Sauberfrau". Stern.de . 2005-11-08. Retrieved 2015-10-25. 1 2 3 4 5 6 7 8 9 "Chartvelfolgung / Yvonne Catterfeld / Longplay" (in German). musicline.de PhonoNet. Retrieved 2010-03-27. ↑ "Yvonne Catterfeld: Warum sprach Mariah nicht mit ihr?". Berliner Zeitung . 2003-10-15. Retrieved 2015-10-25. ↑ "In Hoyerswerda wird der "Lucky Star" gesucht". Lausitzer Rundschau. 2002-12-18. Retrieved 2015-10-25. ↑ Leese, Sylvia (2005-04-04). "The Dome: Catterfeld schmeißt hin!". Berliner Kurier . Retrieved 2015-10-25. ↑ "Yvonne Catterfeld synchronisiert "Shark Tale"". Berliner Zeitung . 2003-10-15. Retrieved 2015-10-25. ↑ v. Mutius, Franziska (2005-06-12). "Veronika Jarzombek: "Ich beteilige mich nicht an dieser Schlammschlacht"!". Berliner Morgenpost . Retrieved 2015-10-25. ↑ Lückerath, Thomas (2005-12-09). "Erster Telenovela-Flop ist amtlich: ARD stoppt "Sophie – Braut wider Willen"". DWDL.de. Retrieved 2015-10-25. ↑ Dobler, Eberhard. "Yvonne ist jetzt eigenständig und verwendet Scratches". laut.de. Retrieved 2015-10-25. 1 2 Ber, Crib (2009-12-30). "Yvonne Catterfeld wäre beinah ertrunken". Moviepilot. Retrieved 2013-08-20. ↑ Weis, Manuel (2007-10-31). "PR sei Dank: Sehr gute Quoten für Catterfeld-Film". Quotenmeter.de. Retrieved 2015-08-20. ↑ "TV-Schmonzette mit Yvonne Catterfeld" (in German). TVSpielfilm.de. Retrieved 2015-10-20. ↑ "Keinohrhasen feiert sechs Millionen Zuschauer". Kinozeit. 21 April 2008. Archived from the original on 16 October 2008. Retrieved 2008-12-13. ↑ Carsten Baumgardt. "Keinohrhasen review". Filmstarts (in German). Retrieved 2008-12-29. ↑ "U-900: Kritik" (in German). Cinema.de. Retrieved 2015-10-20. ↑ "Schatten der Gerechtigkeit: Kritik" (in German). TVSpielfilm.de. Retrieved 2010-03-27. 1 2 Thissen, Torsten (2010-10-16). "RTL lässt die Eifel in die Luft fliegen" (in German). Die Welt . Retrieved 2010-03-27. ↑ "Der kress-Quotencheck: Mittermeier drängelt sich nach vorn" (in German). Kress.de. 2009-12-02. Retrieved 2010-03-27. ↑ Sander, Daniel (12 February 2008). "Ein Soap-Sternchen gibt den Weltstar" (in German). Der Spiegel . Retrieved 14 February 2008. ↑ "Ich hatte eine Gänsehaut". Süddeutsche Zeitung. 12 February 2008. Archived from the original on June 12, 2010. Retrieved 14 February 2008. ↑ "Die Frau des Schläfers: Sat1 und Yvonne Catterfeld punkten mit Einschaltquoten" (in German). Entertainment-Gossip.de. Retrieved 2015-11-13. ↑ Schmidt, Thomas E. (2010-10-26). "Netter Normalversager" (in German). Die Zeit . Retrieved 2015-11-13. ↑ Schlüter, Jan (2012-11-09). "Catterfeld bringt ZDF starke Quoten" (in German). Quotenmeter.de. Retrieved 2015-11-13. ↑ Mantel, Uwe (2011-10-19). "Von wegen Event: Catterfeld-Film bei Sat.1 schwach" (in German). Quotenmeter.de. Retrieved 2015-11-13. ↑ Schlüter, Jan (2012-02-08). "Primetime-Check: Dienstag, 7. Februar 2012" (in German). Quotenmeter.de. Retrieved 2015-11-13. ↑ Pilz, Michael (2010-10-16). "Es war nicht alles schlecht in der DDR" (in German). Die Welt . Retrieved 2013-10-03. ↑ Weis, Manuel (2013-06-07). ""Helden": Vernichtende Kritiken, starke Quoten" (in German). Quotenmeter.de. Retrieved 2015-11-15. ↑ "Catterfeld sagte Rolle in "Fast & Furious 6" ab". Focus.de. 2014-04-26. Retrieved 2015-11-11. ↑ "Berlinale 2014: Competition Complete". berlinale. Retrieved 2014-01-15. ↑ "EFA Opens Vote for People's Choice Award". European Film Academy. Retrieved 4 September 2014. ↑ "European Film Academy opens vote for People's Choice Award 2014". Cineuropa. Retrieved 4 September 2014. ↑ "Juliette Binoche, Marion Cotillard, Kristen Stewart Among France's Cesar Awards Nominees". The Hollywood Reporter . Retrieved 31 January 2015. ↑ "Cesar Awards: 'Timbktu' Sweeps, Kristen Stewart Makes History". The Hollywood Reporter . Retrieved 24 February 2015. ↑ "Dreharbeiten in Dublin". Gala.de. 2013-05-15. Retrieved 2015-11-11. ↑ Pohlig, Marcel (2014-03-03). "Tatort" triumphiert, RTL & ProSieben überzeugend". DWDL.de. Retrieved 2015-10-25. ↑ Mantel, Uwe (2014-05-05). ""Topmodels" schlagen sich am Sonntag wacker". DWDL.de. Retrieved 2014-10-25. ↑ Dreier, Julia (2014-11-19). ""Bocksprünge": Und Udo? Der macht Kaffee". Badische Zeitung. Retrieved 2015-11-15. ↑ "Yvonne Catterfeld: "Ich komme aus einer sehr kleinen Welt"" (in German). Thüringer Allgemeine. 2015-08-29. Retrieved 2015-11-13. ↑ Granger, Anthony (13 May 2015). "Bundesvision: 2015 Participants Announced". eurovoix.com. TV Total. Retrieved 13 May 2015. ↑ "Revolverheld holen Titel nach Bremen" [Revolverheld take title to Bremen]. Weser-Kurier (in German). 21 September 2014. Retrieved 12 April 2015. ↑ "Die Geschichte der Trapps als kitschiger Heimatfilm" (in German). RP-Online.de. 2015-11-12. Retrieved 2015-11-15. ↑ "ZDF bringt Ken Folletts "Die Pfeiler der Macht" auf den" (in German). Quotenmeter.de. 2014-09-25. Retrieved 2015-11-15. ↑ "Ausgeturtelt: Catterfeld und Carpendale haben sich getrennt" (in German). Abendzeitung-Muenchen.de. 2007-10-23. Retrieved 2015-11-13. 1 2 "Yvonne Catterfeld und Oliver Wnuk im Babyglück" (in German). Abendzeitung-Muenchen.de. 2014-04-22. Retrieved 2015-11-13. "Du bleibst immer noch du"
"Sag mir – Was meinst du?"